For any business that must deliver products or services, having a call center manned with agents to cater to customers is critical. 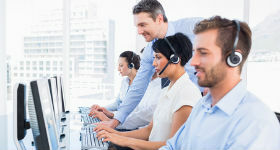 Sure the days of central brick and mortar locations housing agents with switchboards to take calls is long behind us, but the same struggles to manage and maximize efficiency in the call center remain. Most companies today have come to understand the importance of customer experiences and interactions and have invested time and money into focusing on bettering them. For those who have not, they most likely learn the hard way when a poor interaction or experience goes viral. Since agents have an incredibly difficult job of delivering optimal care and meeting productivity numbers, their needs cannot be ignored. Anyone interested in learning about how to improve agent productivity and keep staff happy, Jacada (News - Alert) is hosting a free Webinar on Oct. 29 at 1 p.m. ET to uncover the technologies call centers require. The webinar, “What Your Agents Know But Won't Tell You (7 quick wins to improve your agent productivity)” will feature Dany Weil, the Chief Technology Officer at Jacada and Karnail Jita, Senior Solutions Consultant at Jacada, and will not only focus on the ways to improve agent productivity but also talk about the technologies currently available that can change the way the call center operates while also cutting costs and creating a better overall outcome. Jacada’s agent productivity solutions make it possible for companies and their agents to focus on customer wants and needs without worrying about any complicated or manual tasks to get them where they need to be. From better scripting, to relevant on screen information about customers and better guidance for case resolution – agents are empowered to do their jobs and can be satisfied with the results.